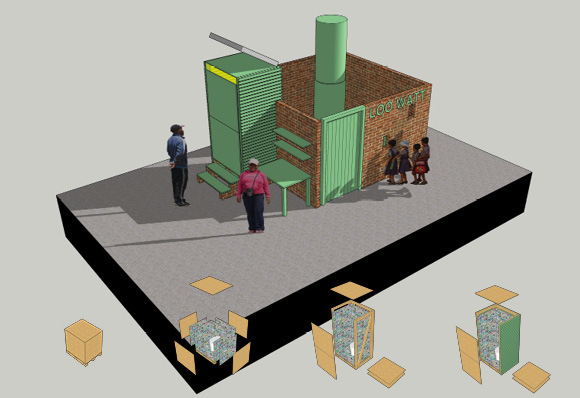 Granit Architects has recently collaborated with Loowatt on the design of a portable waterless toilet and bio-digester for use in the developing world. The concept involves a module that can be delivered to site on a standard palette and easily constructed by an unskilled person. The WC unit is pre fitted to the base of the palette and the side walls and top of the crate are then used to form the WC cubicle itself. The waterless toilet can be used completely off grid and naturally lends itself to a multitude of applications such as camp sites, festivals and building sites. When combined with the bio-digester, the toilet is capable of turning waste into a free source of bio-gas which can be used for cooking and heating. We are pleased to be involved in such an exciting project. Watch this space for any developments.